The young son of the pregnant 27 year old woman, Meriam Yahia Ibrahim Ishag (pictured above), who was sentenced to death in Sudan last week for Apostasy (her crime was marrying a Christian man - read here) is forced to live in jail with his mom. Meriam who is reportedly shackled & bleeding in her prison cell, is expected to give birth to her second child on or before June 1st, Hollywood Life reports. We thought that Meriam’s story could not get any worse, but it has. It turns out that while a very pregnant Meriam awaits her death sentence in prison, her precious little boy has been forced to live inside her prison cell with her. Meriam will also have to care for her unborn baby in that cell once it is born. Reports claim that the Sudanese government will not allow Martin’s father to care for him while Meriam is in prison solely because he is both a Christian and an American citizen. 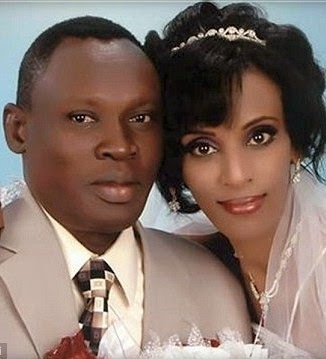 Meriam is currently in prison because she refused to renounce her Christianity in front of a Sudanese court. Because she was born in Sudan and is therefore automatically considered a Muslim by their government, they have condemned her for committing apostasy. Since Sudan sees her only as a Muslim, they refuse to acknowledge her marriage to a Christian man. Therefore, the court was also able to charge Meriam with adultery. Meriam has been sentenced to 100 lashes for adultery, but will ultimately be killed when she is hanged for committing apostasy. The court has allowed her time to birth and nurse her baby before she will be killed. Meriam’s husband has also been to visit her in prison when allowed and the description of what he found is almost unbelievable. As soon as he heard that his wife was in prison and facing death, Daniel hopped a plane from his New Hampshire home and flew back to his homeland of Sudan. After his visit, Daniel claimed that his wife was shackled to the floor inside her cell, and that the shackles were causing her ankles to bleed. Daniel also mentioned that Meriam’s legs are swollen, and he fears she is not receiving the proper medical treatment she needs.